April Market Comments | American Precious Metals, Inc. The price of gold is rising. Why? 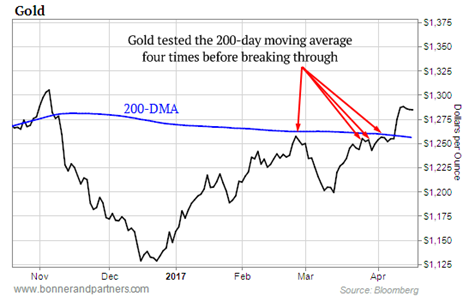 There are many causes for the upward movement of Gold from last year’s low price of $1,125 per oz. The most basic one is the increase in worldwide demand while mining output continues to decline for four straight years now. China has been increasing its reserves and India’s currency crisis has subsided, allowing gold buying there to resume. Closer to home, there has been a sharp increase in purchases of gold and silver exchange traded funds (ETF’s). The dollar has been weakening vs. other currencies. Budget deficits are going to be larger than forecast. Government economic numbers are always suspect. The Fed says inflation is 1.6%. Any housewife knows better! To the shock of the investment media, Nieman Marcus disclosed today that they are borrowing money to pay interest on their debt; a sure sign of bankruptcy. The US treasury has been doing that for years! Politics worldwide are now ugly and divisive, with increasing geopolitical tension. That always causes portfolio managers to seek a safe haven. The consumer consensus, having been low so far this year, is starting to improve. By mid-summer, if no progress is made on tax and healthcare reform, coupled with a massive deficit increase to prevent a government shutdown, we should see a rally to take out last year’s high gold price of $1,370.